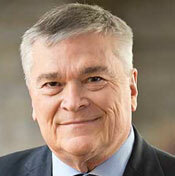 Dr. Eric Barron is the 18th president of the Pennsylvania State University and a member of the URA Board of Trustees. Previously he served as the 14th president of Florida State University and director of the National Center for Atmospheric Research (NCAR) in Boulder, Colorado. Prior to these positions, Dr. Barron was a faculty member, and became dean, of the College of Earth and Mineral Sciences at the Pennsylvania State University, from 1986 to 2006. He also served as dean of the Jackson School of Geosciences at the University of Texas at Austin before becoming NCAR director in 2008. Barron is a fellow of the American Association for the Advancement of Science and has served as chair of numerous National Science Foundation, NASA, and United States National Research Council (NRC) committees and panels, including the NRC climate research committee, the NRC board on atmospheric sciences and climate, and NASA’s earth observing system science executive committee. Dr. Barron holds a Bachelor of Science in geology from Florida State University and two postgraduate degrees in oceanography, a Master of Science and a PhD, both from the University of Miami.